With the third quarter coming to a close on Saturday, it brought gains to the S&P 500 for the eighth straight quarter. The last quarterly loss for the index was the third quarter of 2015. The end of September also marked the tenth monthly gain out of the last eleven for the S&P. Looking at the third quarter results for the four main US indices, we see that Nasdaq Composite gained 5.79 percent to lead the way for the quarter. The Russell 2000 gained 5.33 percent, the Dow gained 4.94 percent and the S&P was the laggard, but still gained 3.96 percent. The only one of the indices that spent much time in negative territory was the Russell, but it reversed course half way through the quarter and finished it out strong. At one point, the Russell was down 4.1 percent for the quarter. Looking at the main sectors, nine of the ten gained ground during the third quarter. Technology led the way with a gain of 8.28 percent followed by energy with a gain of 6.03 percent. Like the Russell 2000, the energy sector had to make a big come back to finish second. Half way through the quarter, the sector was down almost five percent. The only sector that lost ground during the quarter was the consumer staples sector and it lost 2.02 percent. 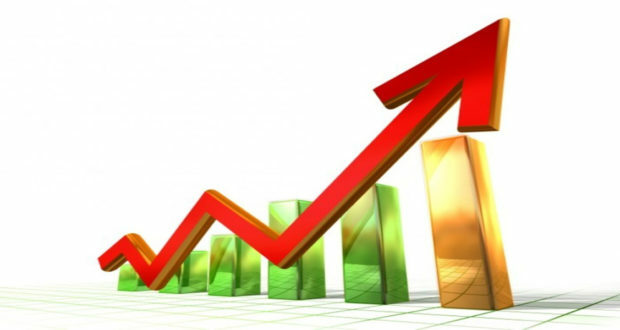 It is worth noting that both the materials sector and the telecom sectors gained over five percent during the quarter. 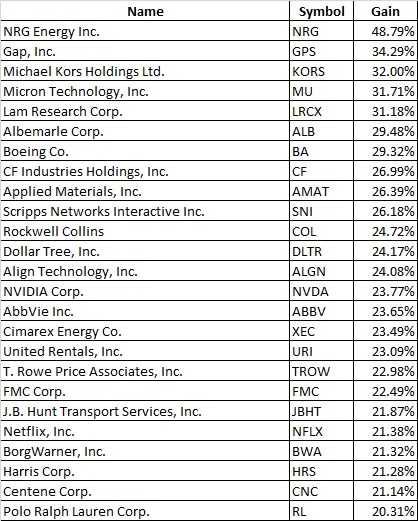 As for individual stocks, the following table shows the top 25 performing stocks in the S&P 500. In all there were 26 stocks in the index that gained at least 20 percent for the quarter. We see a pretty decent mix of industries represented in the top ten. We have a utility stock, NRG Energy (NYSE: NRG) as the top performer, followed by two retailers. Gap, Inc. (NYSE: GPS) rallied sharply in the second half of the quarter while Michael Kors Holdings (NYSE: KORS) started rallying in early August. Rounding out the top five we have two semiconductor stocks in Micron Technology (Nasdaq: MU) and Lam Research (Nasdaq: LRCX). It will be hard for stocks to match their third quarter performance in the fourth quarter with the indices at or near record highs in most cases. It also seems that earnings expectations have been ratcheted up in recent months. According to Thomson Reuter’s research, third-quarter earnings are expected to increase by 6.2 percent on a year over year basis.